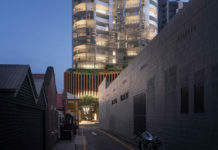 Metro Property have proposed a new 30 storey residential tower located at 13-17 Manning Street, South Brisbane. Designed by Elenberg Fraser, the project consists of 345 residential apartments and is strangely known as South Bank Towers despite being located in the suburb of South Brisbane. The project comprises of a podium level pool, spa and gym on level 4 as well as a large rooftop lounge deck on level 30. The entry and ground floor are defined by the skeletal form. These soft ridges of ‘bonelike’ formation complement the exterior façade, while providing an emotive entry to the residential lobby and adjoining retail spaces. The natural shape and movement of the skeletal exterior seamlessly extends to shelter the residents from the harsh sun, and aid in providing soft dappled light which floods into the apartments. Embedded to its skeletal ‘spine’, the towers ribs peel away in sumptuous curves to form defined balconies and corners. Atop the podium sits a lush landscaped oasis, featuring a lap pool with adjoining plunge and spa areas, sun lounges, a yoga pavilion, as well as a gymnasium. The skeletal bones subtlety curve and fold through the subtropical landscaping to continue to form the tower. These soft forms are shaped in response to environmental conditions, with orientation designed to minimise exposure to the harsh western sun while maximising the stunning views. All images supplied by PDOnline. The DA for this development is A004213280.